One of the most important questions raised when purchasing a suspension system is how well the setup is balanced between street and for race use. 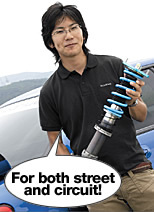 The full suspension coilover kit that Prodrive had released in September, 2006 is considered a street-friendly unit but acclimatizes to the race track setup. Let's see what a rigid suspension system that is optimized in terms of its stroke truly feels like. Prodrive is a European suspension manufacturer who avidly competes in such races as the British Touring Car Championship (BTCC) and the WRC. According to Prodrive, the data and knowledge they acquire from professional racing is directly applied to street applications. The suspension system released in September, 2006 is marked as the “sports suspension system” and is targeted to be used for the streets with radial tires. The unit is height adjustable and the distinguishing characteristic about this set is that the shock absorbs plenty of stoke to make up a comfortable ride. Compared to others, the springs were constructed from strengthened materials to enable a reduced number of coils but still preventing it from bottoming out. The spring rates for the GDB application is 12kg/mm for front, and 8kg/mm for rear, including the secondary springs on the lower springs. The shocks were placed in an inverted design, and a 6mm thick bracket was used to further enforce the rigidness of this unit. By increasing the strength of these areas a much improved sense of the road as well as sharper handling can be experienced. Although this sports suspension system is primarily used for the streets, it can be set for track use as well. This product really gives out a sense that Prodrive succeeded in engineering a suspension system that is emphasized in ride quality still having 16 levels of damper adjustment. Custom spring rates that differ from 1~2kg/mm from the standard rates can be specially ordered. NMB pillowball upper mounts can be chosen as part of the setup. For a softer feeling, rubber mounts are recommended. The pillow upper mounts are recommended for a more direct handling characteristic. 16 different dampening rates can be accessed by each click of the knob. A 6 mm steel bracket was used to enforce the strength of this product. Stronger materials were used to construct the springs in order to reduce the number of coils on the assembly. This increases the distance of the shock stroke safely reducing the risk of bottoming out.